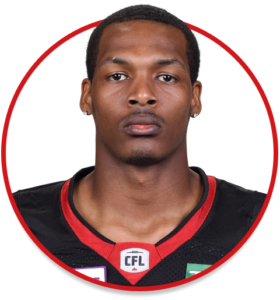 Dominique Davis is a Quarterback currently playing for the Ottawa REDBLACKS. Dressed in all games for the Winnipeg Blue Bombers. Saw limited action behind centre with 17 completions in 29 attempts for 208 yards. He added six rushing attempts for 31 yards. Has appeared in 47 games for the Blue Bombers but has only made one start. He has thrown for 377 yards on 33 of 54 passing in his career while also carrying the ball 16 times for 66 yards. Played for Fort Scott Community College where he led his team to an 11-1 record and a regional title. Davis finished his collegiate career at East Carolina where he played the 2010 and 2011 seasons. He passed for 7,192 yards and 62 TDs in 2 years with the Pirates.